1-0 for Swiss!! Shaqiri to score! Alexander Frei isn't playing for this Swiss squad? Goals were difficult to come by for Ecuador in qualifying. They scored just 20, the fewest by far of any South American team to qualify for Brazil. No, the cross-field ball from Antonio Valencia (or Tony V to Man Utd fans) is predictably poor. Tom, up till now, who's your favourite to lift the cup? Hey tom.. how good do you think Shaqiri is? Will, I'd still say Brazil. Dodgy start, but they'll only get better on home soil. for updates, commentary, and the occasional bad joke! Looks like both sides are equally bad..
Do you think with the shadows, that the Swiss will play on the counter, to shield themselves from the heat? Granit Xhaka leathers a shot wide from 25 yards - that's about the most excitement so far. The teams are saving the quality for when the fan get seated, how nice. Can Ecuador win away from home? 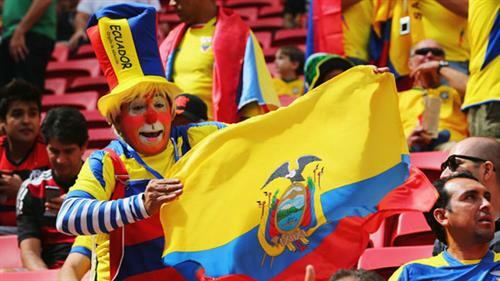 Ecuador didn’t win a game on the road in qualifying but was unbeaten at home picking up 22 of their 25 points in the friendly confines of high altitude Quito. Swiss look uncomfortable at the start. Midfielder is losing easy ball. They need to get into the game. How do you get a Mexican wave with empty seats interrupting?! This thing stinks of 1-0, with the winner around the 70th minute. The midfielder drives a low shot at goal from 20 yards, but Alexander Domínguez does well to take the sting out of it and collect it. a good look for the future LFC man! This a game where will be cheering won corners, just to break the silence. Switzerland needs a better team nickname than just "The Swiss National Team." BR poll? Choppy game so far, to say the least. Action elsewhere for you - Brazil forward Hulk appeared to depart his side's training session on Sunday with a muscle injury. Diego Benaglio comes out to claim a deflected shot and elects to punch it for some reason? Any idea? No, me either. @chen.. apparenlty liverpool are interested in him.. but if lfc are to splash £25m on lallana i cant see rodgers spending a lot on shaqiri as well..